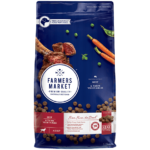 Farmers Market is made by the Real Petfood Company who make VIP Nature’s Goodness and Nature’s Gift. These are brands commonly found in supermarkets, and when it comes to supermarkets it’s not hard to raise the bar. These foods offer a discerning dog owner a better alternative. Let’s take a look at the “Beef with Farm Vegetables” dry food recipe. The chicken recipe in the dry range is similar, and they offer wet foods too. The first ingredients are beef meal and chicken meal which is great to see, especially with this being a supermarket brand. Most supermarket brands are packed full of filler grains and by-products, so we’re already off to a very good start. Meat meals are protein-rich ingredients which our dogs need. Next up we find carrots and peas, both nutritious, healthy veggies. The peas will add protein and fibre. After that we have an inclusion of grains, a mixture of wheat and oats. Wheat is the cheaper (and less nutritious) of the two, so it’s likely there’ll be more wheat than oats. Wheat is one of the biggest culprits of allergies in dogs, so if your dog’s scratching or having ongoing digestive issues on this food then that could be the reason. I’d prefer they removed the wheat in favour of oats. Protein is added in the form of vegetable and chicken protein. 28% protein is above average and good to see, but the fat percentage of 12 is a bit lower than other premium foods. Dogs need animal fats for energy as well as nutrition. Chicken gravy really means “chicken digest”, a nasty ingredient from animal rendering. It’s in nearly all dog foods, and it’s fascinating to see how different companies label it as something that sounds tasty. The inclusions of beef liver, kelp, and linseed (flaxseed) are nice to see. As far as supermarket foods go this is a good all-rounder, but if you also find Applaws on the shelf (in most Coles and Woolworths) then that’s the better option. Meat meals as the main ingredients, backed up by veggies. Wheat is a bit of a let down as a cheap allergenic filler grain. Beef Meal, Chicken Meal, Carrots, Peas, Wholegrain Wheat and Oats, Poultry Fat Stabilised with Mixed Tocopherols (source of Vitamin E), Vegetable Protein, Chicken Protein, Beef Liver, Beet Pulp, Chicken Gravy, Parsley, Whole Linseed (source of Omega 3 & 6), Kelp Meal, Garlic, Salt, Canola Oil Stabilised with Natural Mixed Tocopherols (source of Vitamin E), Potassium Chloride, Choline Chloride, Chicory Root Inulin (Prebiotic), Yucca Extract, Essential Vitamins and Minerals, Natural Antioxidants.